The continuation of the multiplayer FPS with strategy elements, being a continuation of the legendary Quake’s freeware modification from 1996. 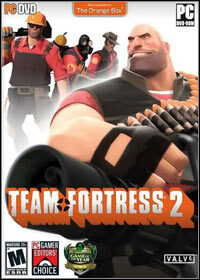 Team Fortress 2 for PC from Valve Corporation may be categorised as a cooperation-oriented multiplayer FPS with strategic elements. The authors deem their production as "the best looking and best-playing class-based multiplayer game." Gameplay consists in completing a number of missions, which the other team tries to prevent. With some elements, this production resembles the original Team Fortress, i.e. leading the team composed of six soldiers with unique abilities. No matter what mission you are carrying out, the most important factor is cooperation between soldiers and maximally effective use of their abilities. There are nine classes, each known from the former instalment: the Heavy, the Spy, the Scout, the Demoman, the Engineer, the Medic, the Sniper, the Soldier, and the Pyro. There’s something for everyone! Players who prefer Rambo-style action should choose the Heavy or the Soldier; advocates of more subtle actions may decide on the Scout or the Sniper, while those preferring fighting from the second line might choose the Medic or the Engineer. The authors tried not to overpower any class, so they made sure that the heroes’ strong points interweave with their disadvantages. So, the Heavy with his huge firepower is slow, while the Scout is fast, but has little resilience to attacks. To find a way of the most effective use of the heroes’ advantages means finding the key to success. The most surprising thing the creators implemented is certainly the graphic style. Unlike most of modern games, Team Fortress 2 released on PC does not try to look as real possible. This time the title features comic book or an animation movie style. Players are presented with a new system of lighting effects and unique animations – full 3D with very little details. Due to that, soldiers look like a hybrid of comic book heroes and action figures. Moreover, their models are greatly overdrawn: wide, massive shoulders symbolising strength, sickly thin silhouettes perfect for hiding, etc. Game score 8.79 / 10 calculated out of 2564 players' votes. Expectations before the premiere: 7.8 / 10 calculated out of 10 players' votes.